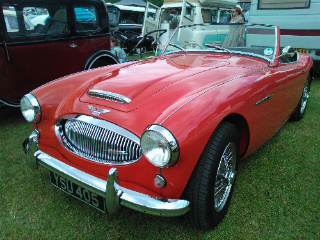 The Austin-Healey sports car. 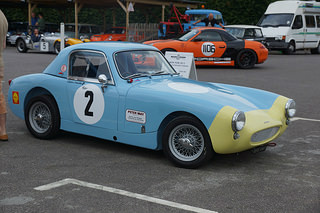 Towards the end of 1951, Donald Healey decided that what his company needed was to produce a sports car positioned in the market between the Jaguar XK120 and the MG TD. 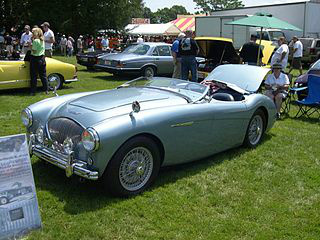 In September 1952, he named his prototype the Healey Hundred since he was confident it would reach 100 mph. 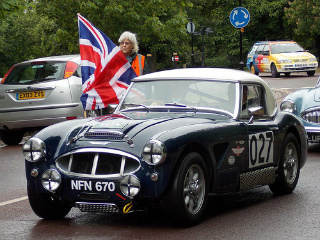 Following his car's presentation at the International Earls Court Motor Show a month later, he signed a 20 year joint venture agreement with the Austin division of the British Motor Corporation to produce the car on a much larger scale. 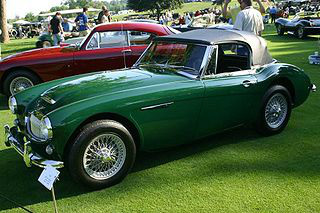 Hence the birth of the Austin-Healey 100 sports car. 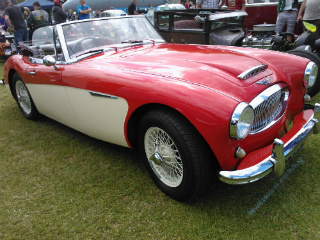 The full range of Austin-Healey cars was manufactured continuously until the agreement ended in 1972. 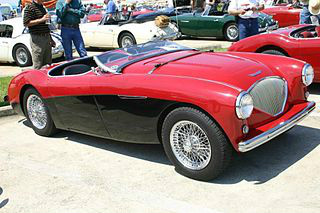 Renamed the Austin-Healey 100-4 sports car, production commenced in 1953. It was classified as the BN1 series. 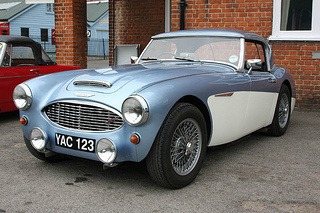 The transmission was modified to include a three speed gearbox with overdrive on the top two gears. 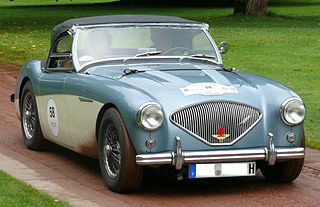 In 1955, the BN2 series of the Austin-Healey 100-4 was introduced. 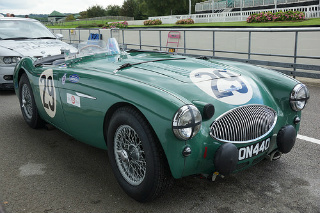 It differed from the BN1 in that it was fitted with a four speed gearbox, with overdrive on gears three and four. An interesting optional extra was the paintwork in the form of two colours (one colour separated from the other). 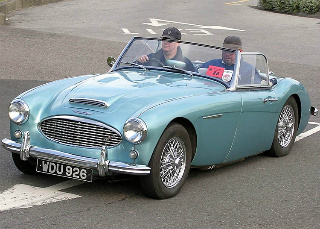 Also in 1955, another BN2 variant, designated the Austin-Healey 100M, was introduced, where the symbol "M" meant that it was modified. 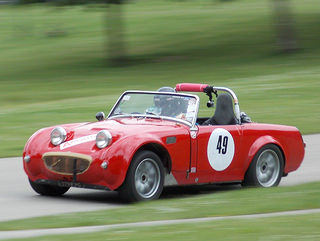 It had larger carburettors, and incorporated a high lift camshaft. Some three-quarters of these cars were finished with the two tone paint system, only available as an option in the BN1 series. 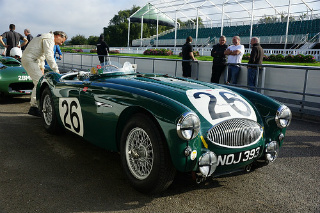 Finally, in 1955, a limited edition BN2 variant was introduced, designed specifically for the track. 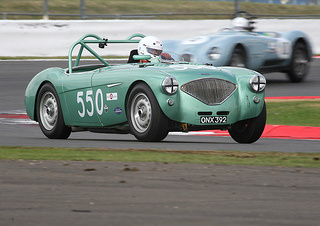 It was designated the Austin-Healey 100S, where the "S" referred to it being entered in the Sebring race meetings in Florida. 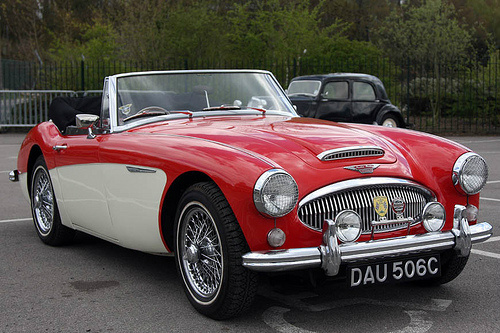 Only 50 were ever built. As a weight saving measure, instead of a cast iron cylinder head, one made from aluminium was used, as were the body panels. There was no overdrive unit, nor bumpers or a hood, and it was the world's first production car to include all round disc brakes. Most of the cars received the two tone white and blue paint system. 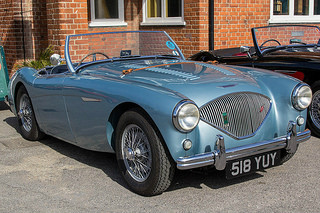 In 1956, the 100-4 was phased out and replaced with the BN4 series, the first variant being the Austin-Healey 100-6 sports car. 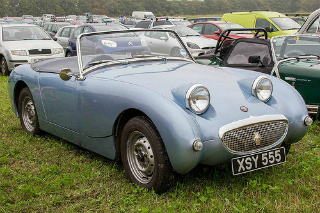 The BN4 contained two occasional rear seats, and a fixed windscreen which could not be folded down, as was the case with the 100-4. A larger, straight, six-cylinder engine replaced the earlier straight four. 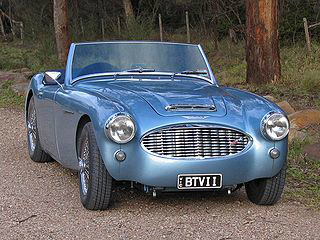 In 1958, the BN6 series was introduced with the Austin-Healey 100-6 sports car. 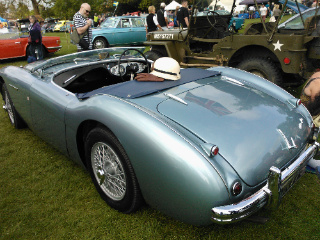 It differed from the BN4 in that it was purely a two seater. 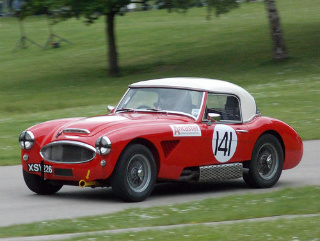 By adding a revised manifold and modified cylinder head, the output was increased to 117bhp. Overdrive was now an optional extra. A combined total of 14,436 BN4 and BN6 cars were produced. 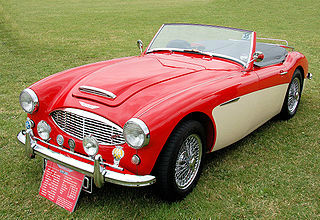 The Austin-Healey 3000 Mark 1 sports car was introduced in 1959, and replaced the 100-6. It was given the designation BN7 series, and was available as a two seater convertible and 2+2 versions. 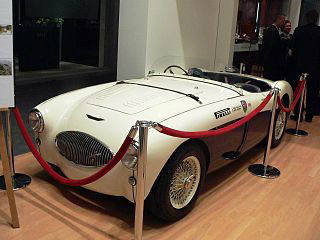 The engine capacity was increased from 2.6 to 2.9 litres. 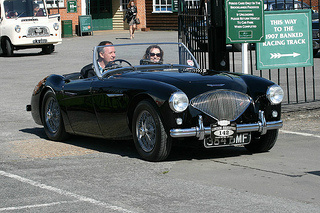 The Austin-Healey 3000 Mark 2, launched in 1961, was designated the BN7 series. 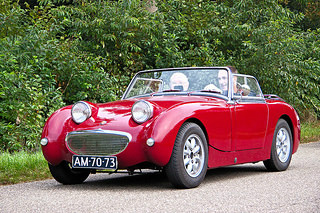 It was offered as a two seater convertible and 2+2 versions. Initially, it was fitted with three SU carburettors, which were reduced to two, a year later, since two were easier to keep in balance. 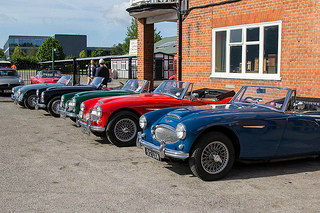 Austin Healey 3000's Seen at Brooklands - what a multicoloured line-up! 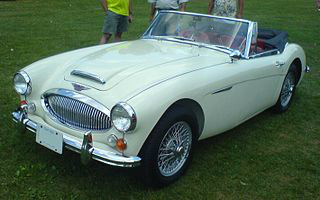 The Austin-Healey 3000 Mark 3 was introduced in 1963, and was the last in the series. Only the 2+2 version was available. Designated the BJ8, it was the most powerful of the "Big Healeys" due to a new crankshaft and re-designed exhaust. 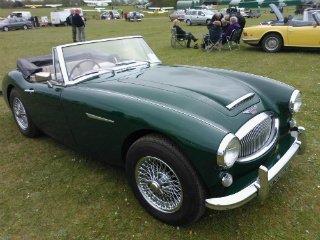 Got any stories about Your Favourite Austin Healey Sports Car?